I’m 76. She might be right. But I feel I might have a chance of winning the race. Although the Air continues to function, three and a bit years in it’s already beginning to show its age. The embedded battery, not user-changeable, is almost defunct and the keyboard inscriptions are now horribly worn, some of them no longer legible. 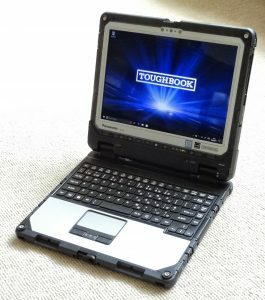 Failing batteries and vanishing key inscriptions are only some of the notebook failings that Panasonic is attempting to combat with its Toughbook range. In designing machines that are built to last, Panasonic is not just up against the ravages of time, but has also to consider a range of hostile environments. Heat and humidity, ice, rain and mud, as well as the tribulations of mechanical vibration and the occasional tumble from the workbench onto the concrete floor—Panasonic’s toughest Toughbook, the CF-33 is designed to withstand them all. AT FIRST SIGHT—PARTICULARLY IF you’re used to today’s sleek Ultrabooks—the Panasonic CF-33 is an ugly brute. The brutishness is, in fact, the design goal; the ugliness then becomes a kind of positive aesthetic if you believe that “form follows function”. When you come to live with the CF-33, as I briefly had the opportunity to do, that World War II look and feel is going to start spelling reassurance and trust in the way that no other portable computer ever has. Case in point: the CF-33 is a dual purpose machine, functioning as a notebook but with a removable touch screen that can be used independently from the keyboard as a tablet. On the day the machine arrived I demonstrated this to a colleague by unlatching the screen. I thought I had latched the screen back onto the keyboard before closing it shut. It was certainly electrically connected. But when I picked up the CF-33 by the handle to carry it across the room, the screen came unhooked and crashed a couple of feet onto the uncarpetted floor. Panasonic recently commissioned IDC to research the total cost of ownership (TCO) for companies running fleets of notebooks. It turns out that 11% of them are going to fail in the first year, and by the time they’ve reached end of life in the fifth year the failure rate will have nearly doubled to 21%. Most of these failures will be the result of accidental damage. These things happen. If it’s your sleek hybrid laptop you’re going to be in for an expensive screen repair. If it’s a CF-33, you just stick the screen back on the keyboard (making sure you understand the latching system this time) and carry on as if nothing has happened. Because, as far as the CF-33’s concerned, nothing has. The screen latch in question reminded me that designers of devices like the CF-33 expect a certain amount of intelligence and diligence on the part of the user. I seem to be in constant conflict with my journalist colleague Barry about this. For Barry, all failure is manufacturer failure; if a thing doesn’t “just work”, blame the vendor. The release latch (right) and the warning window (left) show yellow when the screen is incorrectly engaged. The CF-33 doesn’t “just work”. 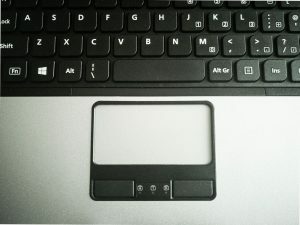 The screen-keyboard connection isn’t just a click-and-connect magnetic latch, as on some Ultrabook convertibles. It’s a military-strength double-locking system with a sliding latch that needs to be unlocked by swinging a catch. And—as I didn’t understand on first use—there are warning windows to alert you to an improper connection. The (non-)accident with the screen started me studying the general design of the machine much more closely. And a user will need to do this. For example, there is a total of five i/o ports on the screen section, each one inevitably a potential ingress for damaging liquid. A single lockable ✽waterproof hatch covers the microSDXC receptacle, the 3.5mm audio socket, and the HDMI and USB 3 connectors. A separate similar lid protects the RJ45 Ethernet port. This screen section (which is in effect the autonomous computer) also has a 15.6volt power-in socket, again protected by its own waterproof hatch. A user will really need to understand how these waterproof covers latch open and lock shut. Symbols on the hatches give an indication, but a careless user could very easily fail to lock down a lid. In fact, the consequence of this need not necessarily be fatal, even in a rainstorm, because Panasonic’s protection is more than skin-deep. But Panasonic’s official certification only applies if the user takes care of details like this. A belt-and-braces approach won’t work as intended if you walk around with your belt undone. ✽“Waterproof ” here refers to “IP65” certification. This is a metric of “Ingress Protection” derived from independent test results on the penetration of both solids (ie, dust) and liquids. The first digit relates to solids and 6 is the highest possible rating. The second digit, 5, indicates that the machine as a whole should be able to withstand low pressure water jets and hence conditions like heavy rain. The yellow warning signs that the screen is either absent or improperly connected. The keyboard is in effect a passive peripheral to the screen section, also acting as a docking device by adding no less than nine more ports. The five on the left-hand side are a second power-in port, an SDXC card socket (like the screen’s microSDXC this has a maximum capacity of 2TB), a second HDMI port, a USB 2 connector and a 15-pin VGA port.The right-hand side of the keyboard houses an old-style DB9 port, a second Ethernet port and a pair of USB 3 sockets. Each of these has its own waterproof hatch. Like most notebooks, the chicklet keys have a short action and little in the way of a tactile or audible click. But the layout is uncramped and I would happily use that keyboard all day long✽. One important feature does seem to be missing—the keys aren’t backlit in the version reviewed here. A backlit keyboard is available as a cost option. ✽Although, frankly, I’d like to be able to dictate as well, something I’ve become very used to on the Mac and Android devices I use. But this Toughbook is Windows, and diction on Windows remains as lousy as ever. A shame, because hands-off text entry would surely be a feature you’d expect on a device like the CF-33. 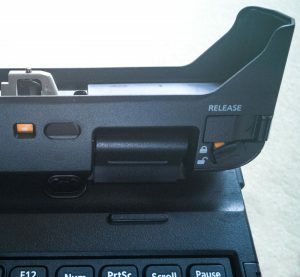 During my initial acquaintance with the CF-33 Toughbook I made a note that although the screen can be articulated back through 180 degrees, at about 110 degrees the additional weight of the screen over the much lighter keyboard makes the device rock unsteadily backwards. Notebooks have traditionally dealt with this problem by limiting the screen hinge to less than the tilt point. 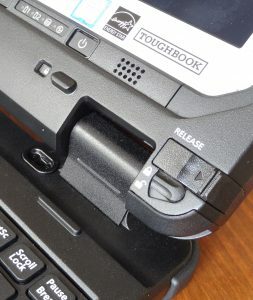 But the many different scenarios the Toughbook is designed for make this full 180 degree hinge a valuable asset. For example, with the keyboard locked into the optionally available car mount, flexing the screen back until it was flat might be useful. On closer acquaintence with the CF-33, I realised the designers had the jump on me. Yes, the screen will keel unsteadily backward at 110 degrees or more—until you discover that the retractable handle folded into the rear can be pulled out to create a completely steady base. With the handle extended the screen can safely be tilted back to any angle you like. I still can’t say I love it. 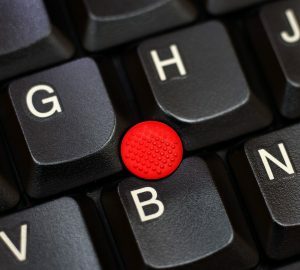 Back in the day when I used an IBM Thinkpad, I got very fond of the TrackPoint, a tiny but responsive joystick embedded in the centre of the keyboard between the G and the H key. I thought a TrackPoint would be ideal on a device like the CF-33. You get full mouse cursor control without having to take your hands off the keyboard. Using a TrackPoint takes some skill and later versions of the Thinkpad included the TrackPoint and a touchpad to keep everybody happy. In the absence of a TrackPoint, my first thought was that Panasonic might at least have provided a much bigger touchpad, and one that was more responsive. Able, too, to cope with multi-finger gestures, as the MacBook Air and other modern notebooks do. There’s no TrackPoint on the Toughbook, although one would come in very handy. It took an experienced Toughbook vendor called Ed Lasher to enlighten me. It turns out that the large, sensitive, multi-touch touchpads that work so well for us in today’s Ultrabooks, simply aren’t up to the job. In the sort of conditions the CF-33 is designed to meet, the capacitive technology they depend on is neither resilient nor durable. A capacitive touchpad detects the presence and motion of your finger from the way it changes the electrical conditions between a pair of charged conductive grids, one on top of the other, with an insulation layer sandwiched in between. The grids can be high resolution, tracking the behaviour of several fingers simultaneously. This arrangement is ideal for something like an Ultrabook in a warm, dry office. Take it out into the cold and wet, says Lasher, and your capacitive touchpad starts misreading those delicate electrical changes. Give the operator a pair of gloves and the thing no longer knows which way is up. Panasonic has elected to use the much simpler resistive touchpad technology. The physical set up is not dissimilar to the capacitive arrangement, but omitting the intermediate insulating layer. Pressure on the surface causes the two electrical layers to touch at that point, so the finger’s presence and location can be calculated. High resolution and multitouch are off the menu, but that positive electrical connection gets accurately registered whatever the weather. As a bonus, Lasher points out, the operator can work with gloves on. When you’re sitting on your dog-sledge out in a blizzard you’ll be grateful Panasonic chose to go resistive. In part 2 of this review we’ll focus on the screen and examine this resistive versus capacitive argument more closely. Because some things have evidently changed since Lasher wrote that page.